We are delighted to have won a sub-contract with Patton Construction for the repair and renewal of historic plasterwork at Lowther Castle near Penrith in Cumbria. Lowther Castle is the seat of the Lowthers, Earls of Lonsdale, with the 17th century house being remodelled from 1806 by the architect Robert Smirke. The plasterwork was mainly by Bernasconi of London. 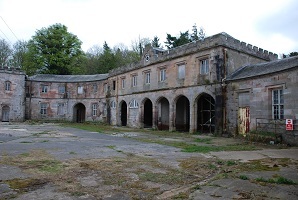 The Castle was stripped and unroofed in the 1950s, although the Stables were left largely intact. Much of our work will be in the making good of plasterwork here as the Stables are converted to an Exhibition and Visitor Centre, Cafe, Shop and units to let. Part of this is the conservation of the gothic vaulting to the Sculpture Gallery, which links to the Castle ruins. We are also going to be repairing the external render. We are currently analysing this, which appears to be an early or proto Portland Cement material, neatly applied and lined out to imitate ashlar.